Hillary Clinton is on the warpath again. On America for rejecting her in 2016. Just this past weekend Hillary told CNN that Democrats “cannot be civil” with Republicans. Hillary said, in the wake of her party’s outrageous and shameless attack on Brett Kavanaugh, that they need to go to war with the GOP. She didn’t distance herself from the phony allegations made against the respected Judge Kavanaugh — she excused them! 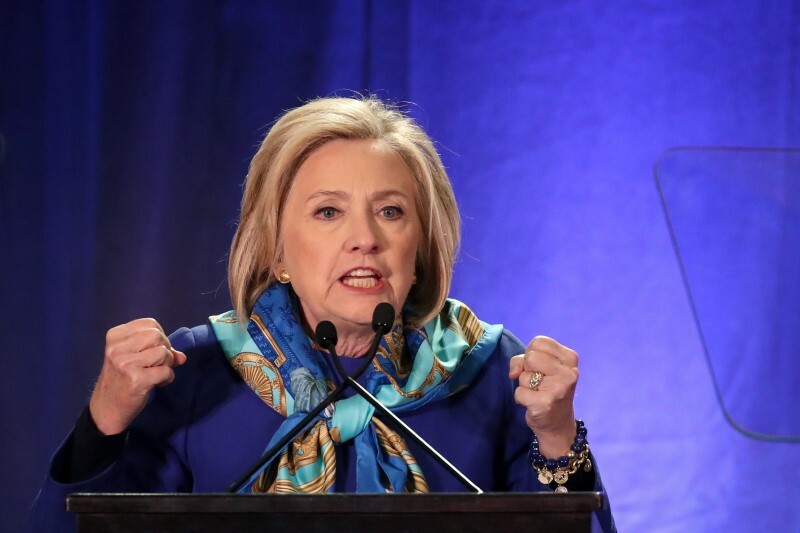 “I remember what they did to me for 25 years — the falsehoods, the lies, which unfortunately people believe because the Republicans have put a lot of time, money, and effort in promoting them,” Hillary said. Isn’t it amazing that every time Hillary is confronted by her own wrongdoing, she claims a “vast right-wing conspiracy” is out to get her? Hillary is paranoid. But it’s no excuse for the blatantly disgusting Democratic character assassination of Brett Kavanaugh. No Republican has ever charged any Democratic nominee with a crime they had no evidence of. Hillary knows that. She also knows this is not about Kavanaugh. It’s about destroying his character. Hillary and her gang want to stop Donald Trump. They are seeking to drive his poll numbers down and help Democrats win in November. That’s just the first goal of their diabolical plan. If they get control of the House and maybe the Senate, they will go into overdrive. People like Dianne Feinstein, Richard Blumenthal, and Chuck Schumer could be running the Senate. If they win this November, they will be calling the shots. All of them. Imagine if Brett Kavanaugh had to face a Democratic-controlled Senate? The shenanigans would have been endless. They will really go after Donald Trump and his key allies. Nancy Pelosi and Chuck Schumer are saying openly they favor impeachment. Here’s what Hillary said about Trump’s coming impeachment. “The question about impeachment — you know, that will be left to others to decide,” Hillary said. Her code language is, yes, they want to destroy Trump and impeach him. But that’s OK, because they don’t want to use evidence to impeach Donald Trump. The green light for the impeachment of Donald J. Trump is ready to be flicked “on” if they win. But this can be stopped. Right now, President Trump’s poll numbers are rising. Americans like you and me revolted when we saw the Democrats’ shocking attack on Brett Kavanaugh. GOP poll numbers across the nation are rising. As chairman of The Conservative Trust of America, I launched a nationwide blitz in support of Brett Kavanaugh. We also targeted key senators. Our two biggest targets were Sen. Jeff Flake of Arizona and Sen. Susan Collins of Maine. Needless to say, both voted YES for Brett’s confirmation. We want to continue these efforts to help our president. We at The Conservative Trust of America are currently engaged in all 8 key Senate races. We are launching a final ad effort to warn the American people about senators like Claire McCaskill of Missouri. She is one of the worst liberals of the Senate. She can be defeated. Donald Trump won Missouri by almost 20 percentage points! I know we can defeat McCaskill and these other liberal senators. All are vulnerable. President Trump won these states with big margins. I want to use the same approach my dad, President Reagan, used in every election he won. It’s simple: Just tell the people what voting for the other guy really means. Here’s the The Conservative Trust’s plan — to run 30-second ads in key races. If you want sanctuary cities for illegal aliens and criminal gangs, vote Democratic. If you want to increase your taxes and do away with the recent Trump tax cut, vote Democratic. If you want an open border and chain migration, vote Democratic. If you want China to keep a $500 billion trade deficit, vote Democratic. If you want Nancy Pelosi and Chuck Schumer running Congress, vote Democratic. These 30-second ads and more like them can be very powerful. A donation right now of $50, $100, or even $200 helps us tremendously. A $1,000 donation would send a powerful message. A $5,000 donation would help us own a whole weekend in a small city in a key race. You have been incredibly generous so far. Your donations have made a difference. Help us continue making a difference — Go Here Now. Please make another donation to support The Conservative Trust for America. I am proud that we helped Brett Kavanaugh. I am proud of President Trump for standing with Judge Kavanaugh. It proves that we can make a difference if we fight together.